Dividend stocks are a “no brainer” compared to Treasuries says Bob Doll, the chief equity strategist for Nuveen Asset Management. He told Bloomberg Radio that with dividends outpacing yields on government bonds, it’s an easy decision in favor of equities. But which high yield stocks should be bought, and which are already overbought? Anything that pays is hot. 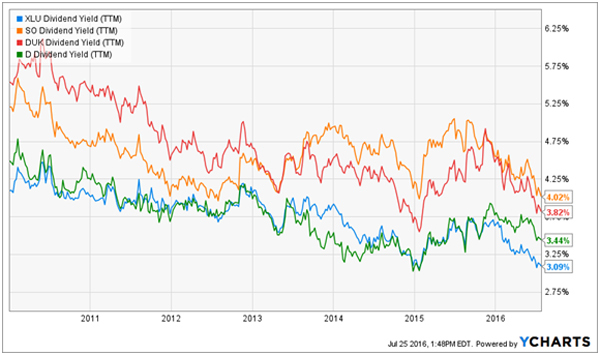 Yields on most utility stocks, for example, are at their lowest levels this decade with popular payers such as Southern Company (SO), Duke Energy (DUK) and Dominion Resources (D) dishing investors between 3.4% and 4% – well below their historical payouts. The market keeps reaching record highs and many analysts worry equities are overvalued in a post-Brexit, stagnant global economy. But that isn’t stopping irrational exuberance from causing overvalued stocks to climb ever higher. We are at risk of rapidly declining stock prices when the market comes to its senses. And in the world of high yield investments, there is an additional risk: dividend cuts would cause those stocks to fall even further. This is especially worrying risk right now, as many high yield stocks have been pushed higher even though their metrics indicate a dividend cut could come soon. Today I’ve got good news and bad news for you—and four stocks with dividends destined to double soon. 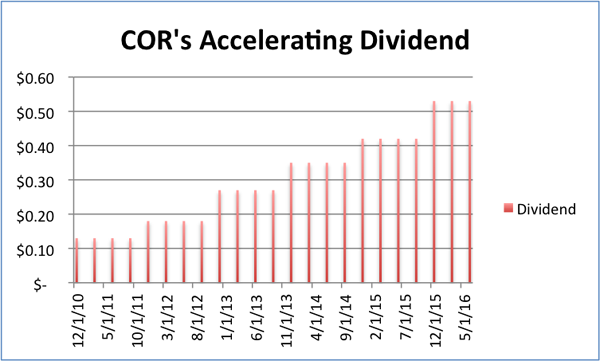 First, the good news: S&P 500 companies are sending out more dividend cash than ever before. According to FactSet, dividends per share (DPS) are at an all-time high, hitting $43.90 in the 12 months ending in April, up 7.5% from the previous 12-month period. The bad news? The party’s ending … or at least winding down. That’s because stalling earnings growth is forcing companies to dig deeper into their profits to keep the dividend parade rolling. 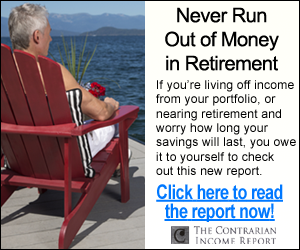 Want a diversified portfolio of uncorrelated assets with a big 8% yield? It’s possible, even in today’s overpriced market. We can easily use just three funds to get a combined yield of 8%. 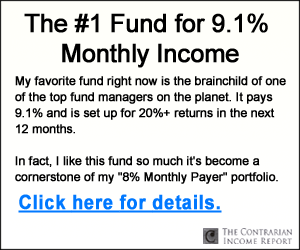 That’s right—just three funds and we can turn $100,000 into a durable portfolio yielding over $660 in monthly income. These funds are in vastly different asset classes, and the dividends from one of them are even tax-free. 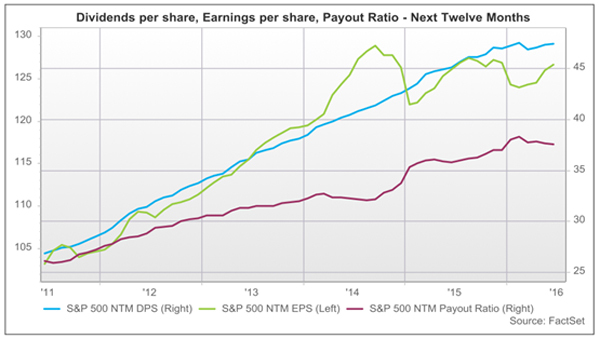 There’s an alleged bubble in “low vol” stocks that is quickly extending to dividend-payers. Here’s how to play it. Since the start of the year, the iShares Edge MSCI Minimum Volatility USA ETF (USMV) has taken in more than $5 billion, placing it first among inflows for stock-focused ETFs. The fund holds stocks that don’t move much, such as General Mills (GIS), AT&T (T) and Johnson & Johnson (JNJ). The market is soaring to record highs, making all stocks too expensive to buy, right? Wrong. While exuberance is in the air, there are still a few overlooked gems paying dividends nearly 4% with strong growth potential. We can easily build a portfolio of four stocks with overall strong revenue growth, growing dividends and a 3.9% average portfolio yield. That yield will only grow in the coming years thanks to each company’s moat, making this a durable portfolio for an IRA or for investors eyeing retirement in the next decade or beyond. If you think dividend stocks are about to soar, wait until you see what happens with the select subset that is actually accelerating its payouts. Low rates for longer means net present value calculations look great for stocks that pay meaningful yields. And those that are boosting their dividends at an increasing rate are basically breaking Wall Street’s spreadsheets. 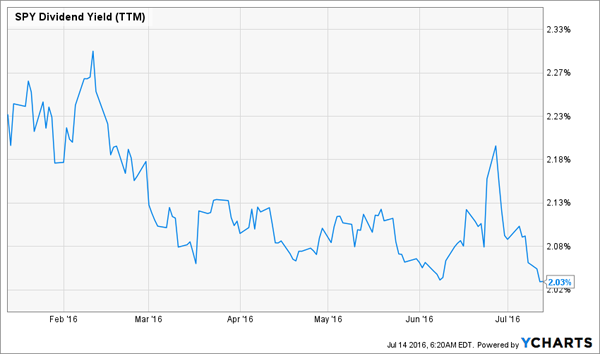 Is the next market brushfire right around the corner? And are investors in denial about it? 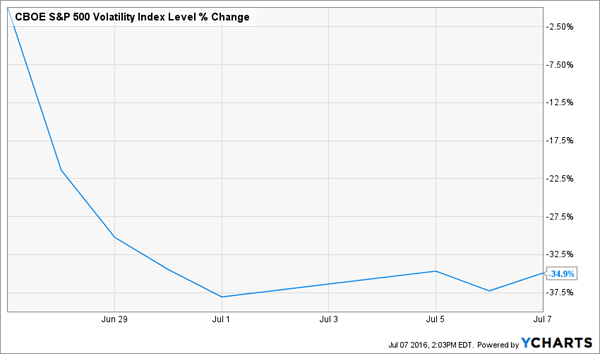 If recent moves in the CBOE Volatility Index (VIX) are any indication, the answer to both questions could be yes. The market’s so-called “fear indicator” plunged 40% in the week following the Brexit vote—its largest-ever drop—as options traders bet the worst is behind us. The VIX has moved back up only slightly since. But don’t break out the bubbly yet. Because if anything, this sudden outbreak of investor contentment—and the disappointment that’s sure to follow—sets the stage for more, not less, volatility to come.